On average, Americans consume 63 gigabytes of information per person per day. That's roughly half of all the storage space in a new MacBook Air laptop. With so much information bombarding us on a daily basis, it's no wonder we've become desensitized to even the most shocking statistics. For example, what if I told you that the 74 million richest people in the world possess 50% of its wealth? The real meaning of this statement would probably be lost on most of us. That's the power of infographics. Those who survive information overload will be those who search for information with broadband thinking but apply it with a single-minded focus. In a world of information overload, the ability to visualize information is more than just a nice-to-have skill -- it's now a necessity. But how can you communicate more effectively when the lack of time and design knowledge limits how far you can go with your message? This easy-to-follow, step-by-step visual guide is designed to bridge that gap between the desire to communicate effectively through infographics and the technical know-how to do so. You can download the complete 110-page visual guide below or scroll down to read excerpts from the book. 1 Define your target audience. The first step to crafting any message, whether in a textual or visual format, is to define your target audience. Who are you communicating to? Business executives? Millennials? Stay-at-home moms? Your answer to this question will set the tone of your copy and the overall mood of your visual theme. Reveal hidden trends and patterns using data. Break down complex information and present it in an easy-to-digest way. Provide your audience with a step-by-step guide on how to do something. Raise awareness of a specific issue or cause. 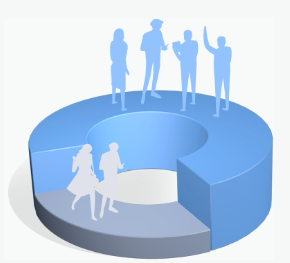 Create a comprehensive, go-to visual resource on a topic. Compare two or more products or concepts. Translate a story, such as a brand story, into a timeline infographic. Each of these different goals corresponds to a different type of infographic, so choose which one best fits your needs at the moment and consult chapter 3 of the complete e-book (download for free above) to determine the best format for your message. Nowadays, many of the infographics created for marketing purposes are published online, which saves a lot of time and resources. But if your objective is to translate a report into a print infographic you can hand out at a meeting with your team members or coworkers, then you’d have to consider factors such as the dimensions of your infographic, file format and image resolution. The infographic above, on the right, for example, is the size of a flyer and has been designed to be printed out on basic letter-size paper (8.5 x 11 in. ), while the one of the right is designed for the web and is typically longer since visitors scroll through to the end (800 x 1600 px). The process for creating a shareable infographic is a lot like the process for writing an effective piece of communication. Think about the last time your wrote a proposal or a paper. How did you begin the process? You probably started by organizing your ideas, then identifying a thesis statement and arguments to support it. Do I already have a thesis statement backed up by data? Or do I still have to conduct research to arrive at a well-supported argument? For example, if your infographic will be based on a company report or any other type of research, then you already have your topic. But let’s say you want to create an original infographic on a trending topic or other news-related issue, then you’ll have to conduct your own thorough research before publishing anything. 5 Find the right information. If you’re looking to create an informative infographic on a current events or social issue, you can also consult a complete list of open-source databases, found in the downloadable e-book above. 6 Find the story in the data. Now comes the part where you “interview” your data to find a story worth telling. 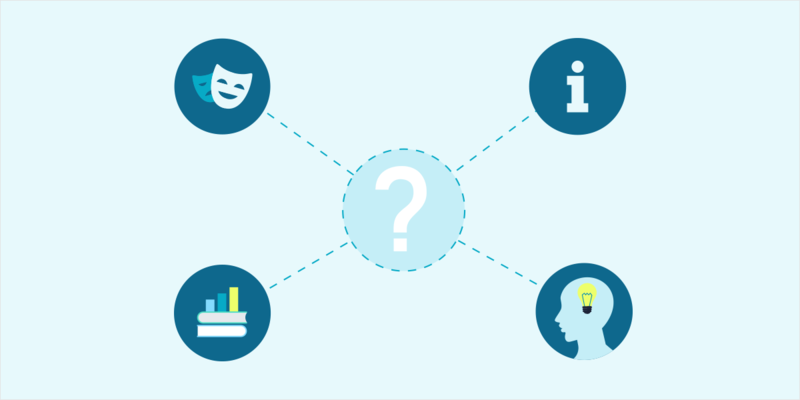 By asking many questions, you will obtain various interpretations of the same data instead of simply sticking with your first reading. Once your data has been cleaned up to eliminate inconsistencies and reformatted to suit your purposes, you can start processing the information using spreadsheet skills, such as sorting, filtering and aggregating. For example, you can sort data in ascending or descending order in terms of size or by location; you can calculate and compare means; you can also compare two data sets. You can also detect patterns by visualizing data through different types of charts. In this e-book, you will find a visual guide for choosing the right chart type for your information. 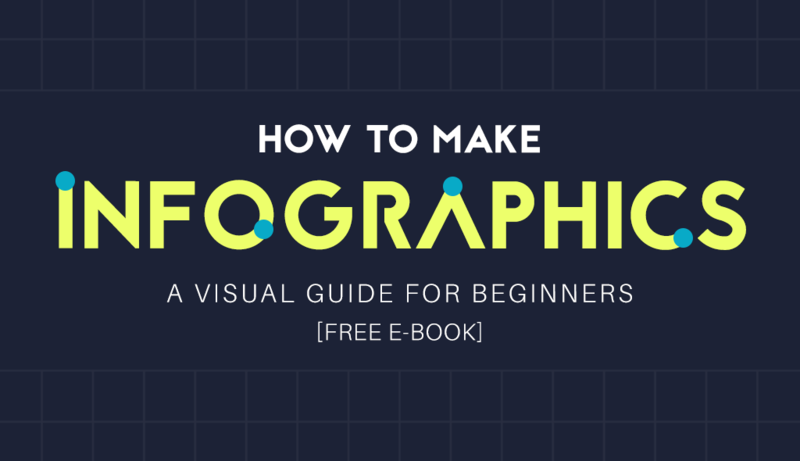 Now comes the part where you choose the type of infographic you want to use. To help you decide which format works best for you, you can follow the steps in this handy flowchart, which you can view in full resolution in the ebook above. Just like with any piece of communication, the key to creating an effective and shareable infographic is zeroing in on the one main message you want to get across. To do this, consider your answers to the questions in steps 1, 2 and 4 of this process: Who is your intended audience, what is your primary purpose and what is your thesis statement? Then, try to sum up the main message of your infographic in just a few sentences. Finally, condense it even further by explaining it in just one sentence. If you’re a communicator of any sort, you’ve likely noticed that people are inherently attracted by stories, while charts and statistics tend to put some people to sleep. This is why it’s crucial to think about the story you’re trying to tell, even before going into the details of how you will present your data. 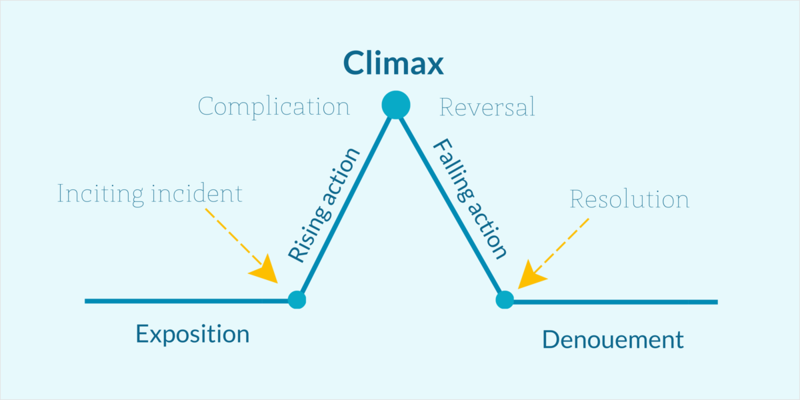 Just like words are usually the main ingredient of a gripping novel, so numbers and charts can also be used as the foundation of a coherent and enticing narrative that binds your visual story together. Instead of citing statistic after statistic, weave an engaging story that uses data as a pivotal point in the story or that leads up to a surprising conclusion. Besides telling a story, you’re also building a case within your narrative. Whether you’re trying to raise awareness of a cause or reveal little-known benefits of a certain food product, you will need to use corroborated facts and figures to back up your claims. 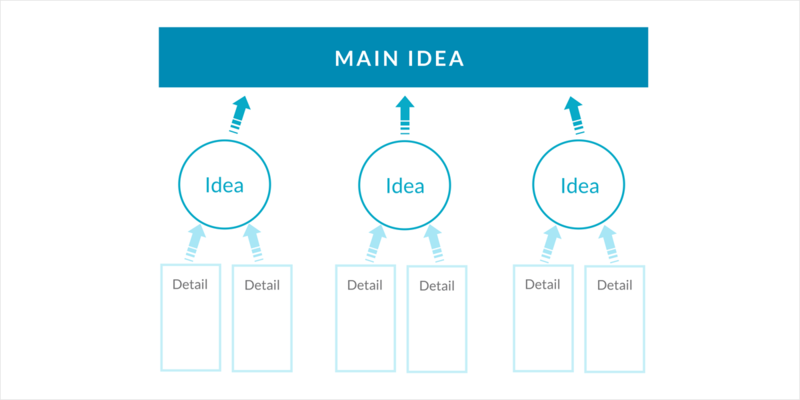 You can start outlining your case by going back to your one big idea and then identifying each of your main points, followed by supporting details. 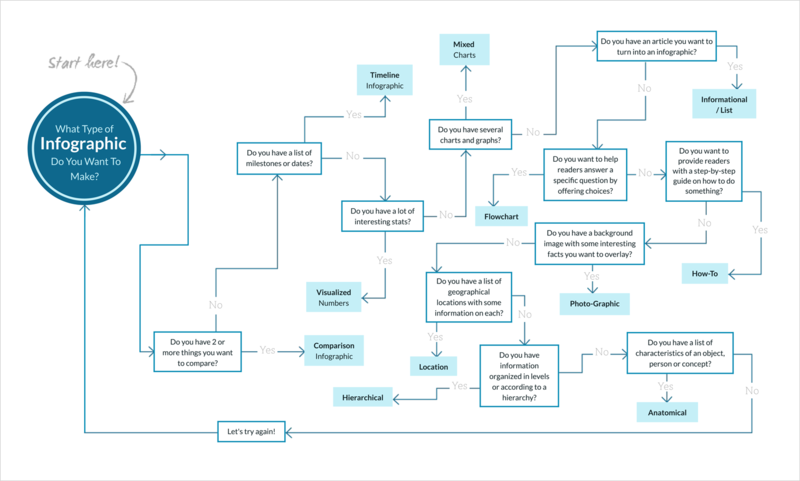 To help you craft an airtight argument, you can use an idea map like this one. If your target audience is comprised of Millennials, then your tone may be laid-back and irreverent; if it’s comprised of business executives, then it may be more serious and straightforward. Next, ask yourself, is your purpose to educate, entertain, inspire or persuade? Your copy should be crafted in accordance with your intended goal. Now you’re finally ready to put all your ideas on paper. But remember: Writing copy for an infographic is not the same as writing content for a business report or an academic paper. Rather, think of it as writing copy for a website: It must be extremely succinct and go hand in hand with the visual elements you will use to accompany your text. According to a recent study, the most shared infographics contain an average of 396 words, so don’t tell your audience something when you can show them. In this visual e-book, you will find a complete breakdown of all the sections you should incorporate in your textual outline, which will form the skeletal structure of your infographic. Now comes the part where you start translating your text into visual elements. To begin, simply create a barebones mockup or sketch of the skeletal structure of your final design based on the type of infographic you chose in step 7. This will help you determine the general placement of both textual and visual elements in relation to each other and allow you to gauge how well your story flows from one point to the next. This way, you can detect early on whether you will need to go back and edit certain parts of your story to create a more coherent narrative. Also, you can determine whether viewers’ eyes are attracted to the most important parts of your infographic or if the key message is lost along the way. You may need to create several iterations of your wireframe before finally arriving at one that effectively tells your story. 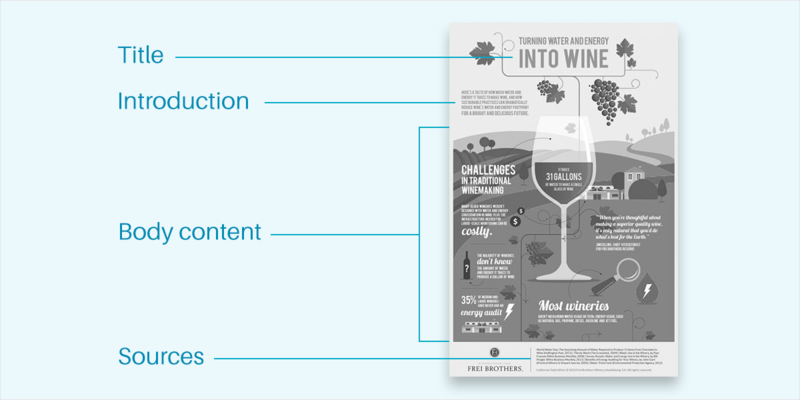 One way to break down the intimidating endeavor of designing an infographic into more manageable mini-tasks is to segment your visual into various content blocks using visual layouts as guides, which you can find in the complete e-book below. If you have any questions or topics you'd like to see us cover more in depth, please let us know in the comments section below! Thanks, Peter. Glad you found it useful. Thanks for infographics tool.. i have created a very good infographics for my blog using your site. Here is the link for post with the infographics created using visme. Thanks Nayomi for your wonderful tips. Infographic is the best visual content sharing arts which enhances a quality traffic for any site. 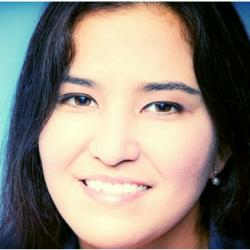 I believe it’s not just a link building strategy, it’s a portrait of your perceptions. Thanks, Dhrubo. Glad you found it useful. Thank you for this post. I’ve dowloaded the e-book about a month ago and I cannot believe you are giving this information for free ! Please don’t change :D. I’ve been interested in infographics since some years ago but never really pushed myself out there to try and make some. With visme and after reading this e-book (I really cannot praise it enough) : gosh, I’d love to make infographics my career ! Have an excellent day ! I’ve just discovered your book and your website, it’s really amazing what you’ve done. I hope you all the best! Thanks for taking the time to create all those custom graphics. What a great way to learn more about infographics.